Prompted by the unstoppable evolution of new technologies in the field of IT communications, the Law Office Grasso intends to become a player part of this evolution and strongly renew itself inside the globalized society marked by Information Communication Technology. In the face of such backdrop, which has relentlessly affected the practice of the law profession, the Grasso Law Office believes to be fundamental the use of all advanced technology tools so that the service offered, in addition to being highly qualified and professional, can better respond to the needs of the clientele, and lastly but not least important, faster and receptive in concrete terms of reactions related to the overall demand of justice. All of this represents the introduction aimed at a better, new and different operating of the professional service offered by the lawyer, essential in a strongly dynamic world in which becomes ever more necessary to safeguard the interests of citizens of the European Union and, in particular, also the rights and interests of East European citizens, mainly Russia and Ukraine, rights which the Grasso Law Office treats as its preferred field. Such goals are the result of a synergetic organizational and communicative ability which the Law Office has turned to through collaboration of interpreters and translators of foreign languages registered with professional registries, in addition to the close ties with institutional and legal partnerships located in the cities of Moscow, Saint Petersburg, Yaroslavl, Kiev, etc. 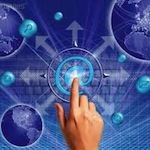 Naturally, the online access by the Law Office to the major national and international judicial databanks are the additional and valid aiding tools for solving the most varied legal problems, in addition also to the full knowledge and command of the major IT and telecommunication instruments. 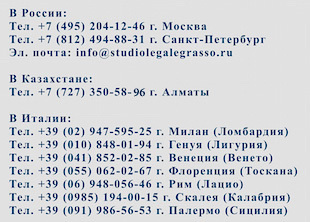 Fully consistent with its policy, the Grasso Law Office supplies general legal aid to Russian and former USSR citizens and, in particular, especially of the contractual and arbitration type of services to East European companies or Italian companies wishing to establish with and not amongst them international business trading relations.